Working together to make public transport accessible for all. One of Chris Orr’s proudest moments as the Blind Foundation Access and Awareness Advisor was the day the electric fleet of trains launched in Auckland in 2015. Features such as the train audio announcements, passenger information displays, high colour contrasts and low level accessibility doors make train travel much safer and easier for people with vision impairments and accessibility issues. “It was enormously satisfying to see advocacy in action but I was only a small part of the puzzle that made that happen,” says Chris. 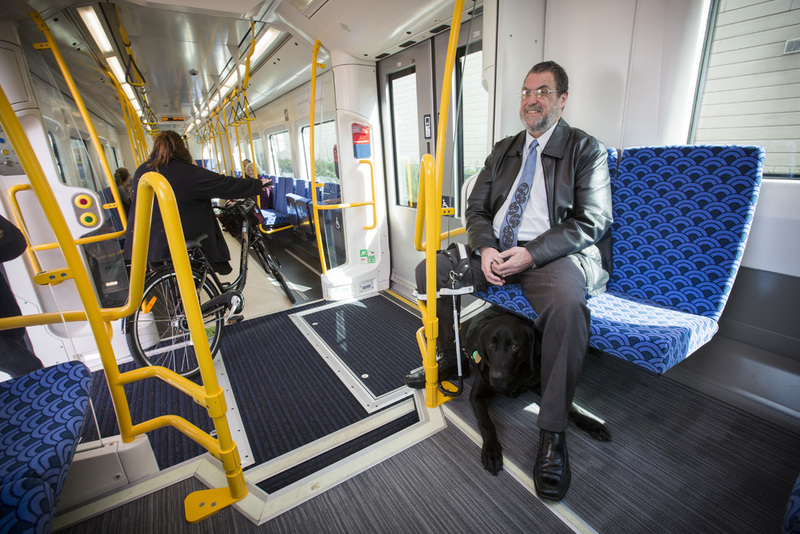 He is among a team of accessibility interest groups working alongside Auckland Transport to make public transport, not only accessible for people who are blind or low vision, but for everyone. The Blind Foundation is part of the Public Transport Accessibility Group (PTAG) along with seven organisations including CCS Disability Action, The Brain Injury Association and Blind Citizens New Zealand. Bimonthly the group meet with Auckland Transport to raise issues on behalf of their community members and work together to achieve the collective goal of making public transport accessible for all. Auckland Transport Media Advisor James Ireland says the Blind Foundation’s contribution is invaluable in providing practical feedback on all aspects of the public transport network. Although public transport has come a long way in terms of accessibility, there is still big projects to come. Technology is creating possible solutions to solve accessibility issues – and one GPS app that Auckland Transport is looking into is BlindSquare, developed for people who are blind or low vision, providing information to guide people as they travel and move around urban areas. The app has already been rolled out in Wellington with the Blind Foundation working in partnership with Wellington City Council, Radiola Smart Transit and BlindSquare. However Chris, who is blind himself, says although there is still work to be done, we have come a long way since undertaking advocacy work. He will continue to advocate on behalf of the Blind Foundation working together with Auckland Transport and other members of PTAG.